These are the ladies from the mystery class at Kindred Spirits Quilt Co. 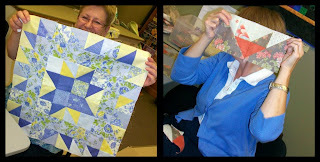 They meet the first Friday of the month and are working on their mystery quilts with the pattern design from Border Creek Station Pattern Co. When you start the project you have no idea what your quilt will look like and each month you get clues for cutting and sewing and the mystery soon reveals itself. These are what they are starting to see come to fruition. It is starting to feel like a murder mystery because at this point we want to kill ourselves due to the fact that we have made a total of 384 half square triangles. It's sort of like playing clue, because you just don't know what it will turn out to be in the end. Is it Pat in the kitchen with the meat cleaver, Debbie in the library with the candlestick, Mary in the bedroom with the rope, Barb in the bathroom with the lead pipe, Kathleen in the garden with the revolver or Carol in her sewing room with a rotary cutter! Keep posted to the blog to see the final episode unfold. This sounds like so much fun. Enjoy!